One of the most panic-inducing and misunderstood tax terms out there is “tax bracket.” Most people know that these “brackets” determine the percentage at which income is taxed, but after that, things get a little blurry. What does it actually mean when you “move up” a tax bracket? Are tax brackets just out to get you? Well, no – and it’s high time we cleared up a little confusion. In the simplest terms, a tax bracket tells you the amount of tax you’re required to pay according to your income and filing status. Each filing status has its own set of tax brackets, so a single person making $10,000 won’t be taxed the same amount as a married couple making $10,000. 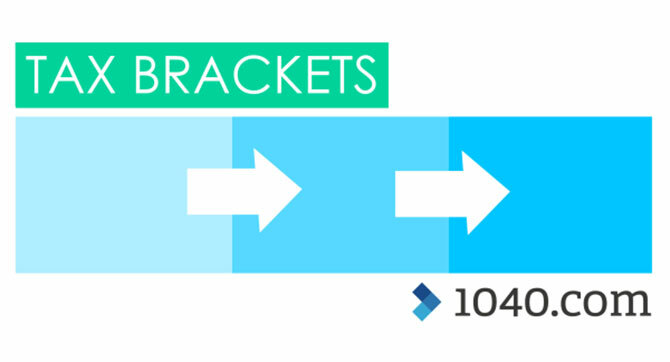 A “bracket” is a range of incomes that are all taxed at the same percentage, and there are currently seven tiers. Those with the lowest incomes are taxed at the lowest percentage, and each bracket increases the percentage of income levied by the federal government. Here’s the part that people get hung up on: When your income moves into the next range up, the bigger percentage doesn’t apply to your total income. Let me say that again: The bigger percentage doesn’t apply to your total income. Each percentage only applies to the income in that range. That means that if you make an extra $2,000 that lands in the next tax bracket, the higher percentage only applies to that $2,000. Let’s look at an example, shall we? Now, say you make $8,000 in 2017. Your entire income amount fits in the 10% range, so you’ll owe 10% of your income amount in taxes: $800. Okay, that was easy enough! But what happens if you make more—say, $40,000—and get put in multiple brackets? Then, you calculate 10% of $9,325, 15% of $28,625, and 25% of $2,049. So your taxes will be $932 for the first bracket, $4,294 for the second bracket, and $512 for the third, bringing you to a grand total of $5,738. But why is this important to know? It’s good to be aware of your income and how close you are to breaking into a new tax bracket so that you can plan to either set more money aside to cover your taxes or adjust your W-4 so your employer can do it. Self-employed people should especially be aware, since they should be making quarterly estimated tax payments based on their income. If you start bringing in extra income and want to know how it will affect your taxes, you can also always use 1040.com’s Tax Calculator. We take your tax bracket into consideration when we estimate your taxes, so you can be aware of your potential tax situation and make any adjustments before you file next year.